I have tried several fish fries at home. I learned this Kodiveri Fish Fry from Chef Jacob. He used egg in this recipe. I felt it to be different from the rest of the fish fries that I make. So far, I used different combination of masala powders and tried out fish fries. This one was far different from the rest of the fish fries. My husband wanted me to make this fish fry right away. I made the fish masala, and it was quite a loose (dropping) consistency. I thought I have gone wrong somewhere. 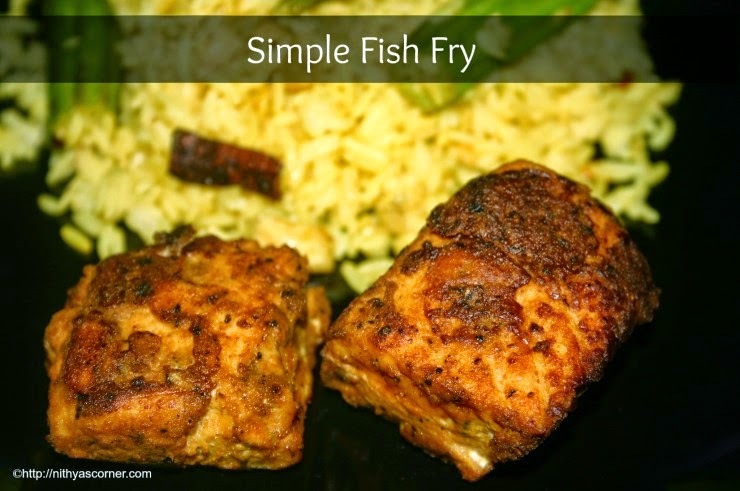 When I fried the fish using the masala, it came out very well…I would say 100% perfect and delicious as how it should be. When the fish is soaked in the dropping consistency, egg acts as a binding agent and makes this fish fry a tasty one. Thank you Chef for sharing this tasty fish fry. 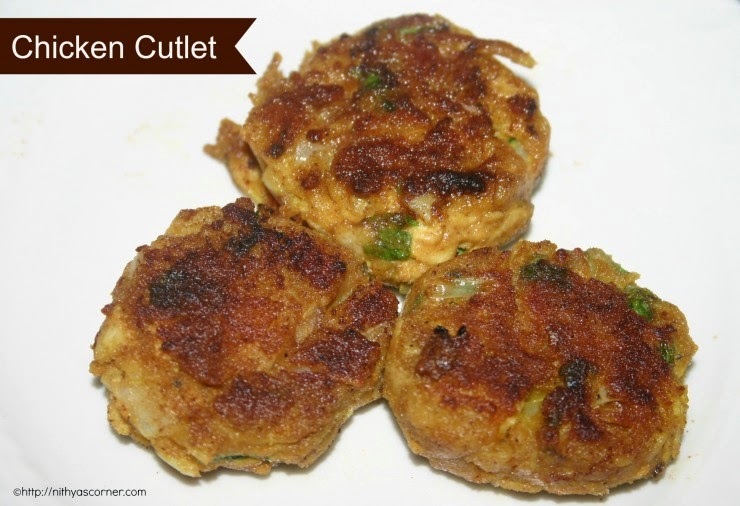 Fish lovers, you should definitely try this tasty dish…You will definitely agree with me. 1. In a pan, without adding oil, add coriander seeds, curry leaves, black pepper, cumin seeds, and turmeric powder in an order. Fry them until rice turns light golden color. Let it cool down and grind them without adding water. 2. In a mixing bowl, put special masala powder, chilli powder, salt, lemon, egg, and water. Mix well. 3. Apply paste on the fishes and let it marinade for an hour. 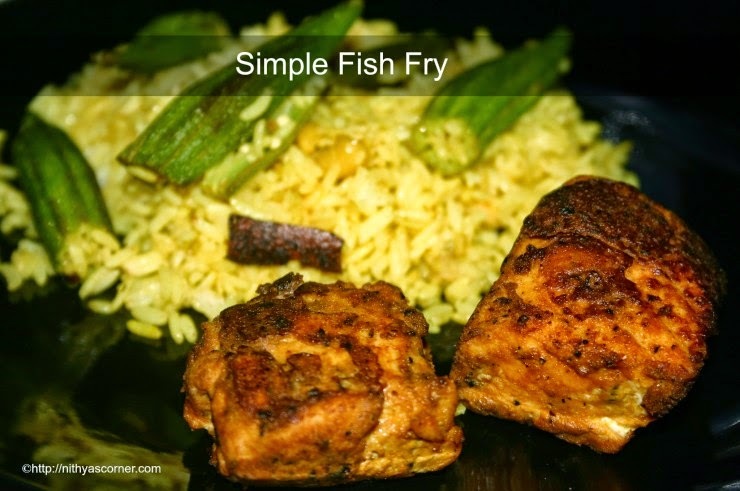 In a nonstick pan, put oil and shallow fry the fishes. 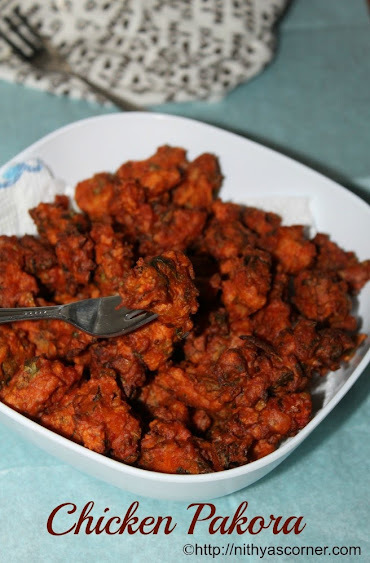 Now, Kodiveri Fish Fry is ready!!! 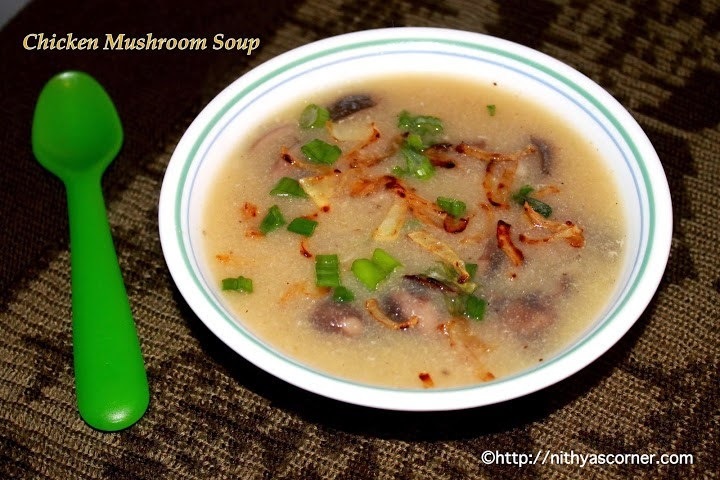 This entry was posted in APPETIZERS | STARTERS | SNACKS, Seafood on November 20, 2014 by vikashbhardwaz. 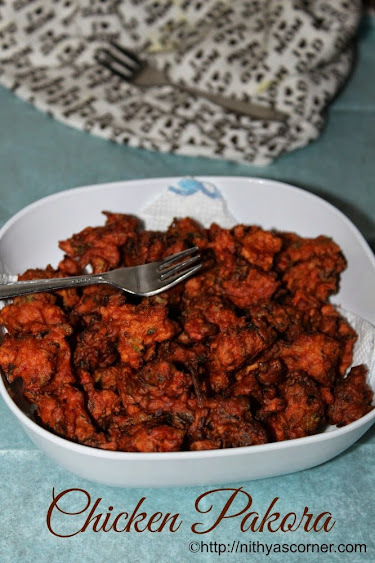 Somas is our family’s favorite recipes. 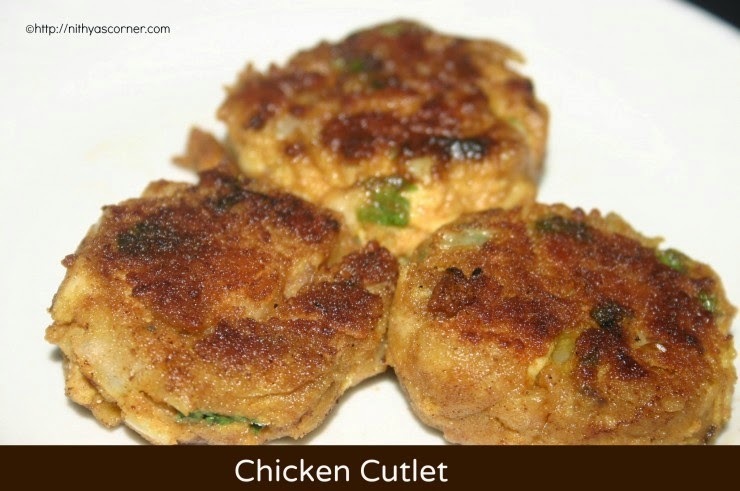 My mom tries the same somas recipe with chicken, mutton and shrimp. 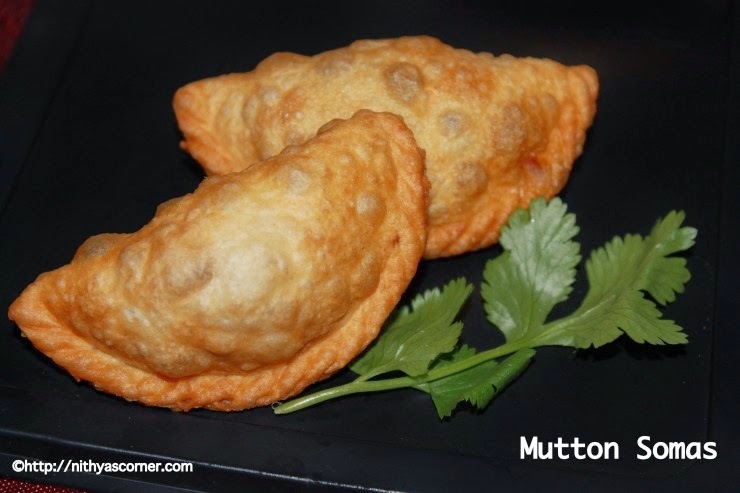 My favorite is mutton somaz. 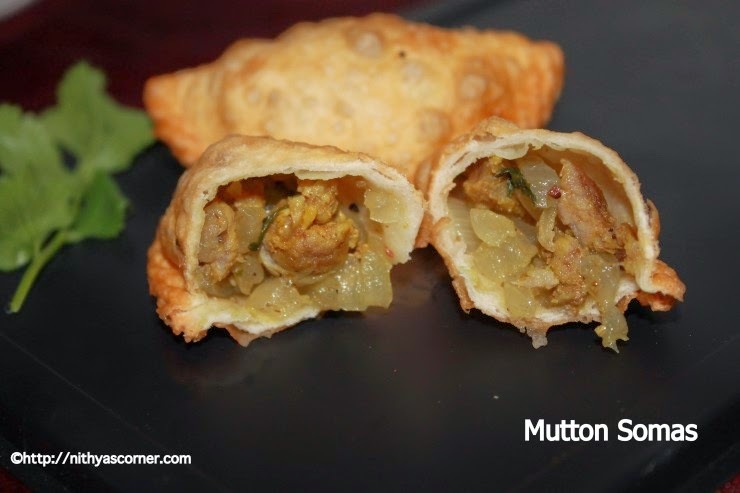 When my mom came to help me for my second delivery, she made this mutton somas for me. In the name of my health, my husband and mother had a good treat. 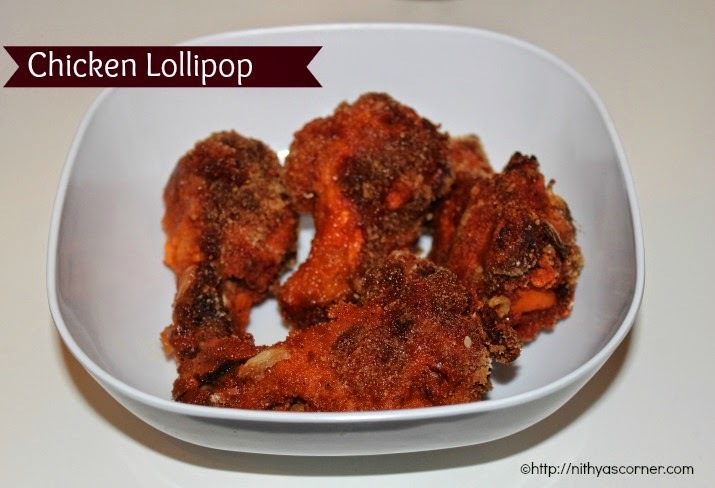 This is a must-try recipe and your family will love it. Cloves (crambu) – 4 nos. Cardamom (elakka) – 4 nos. Cinnamon (pattai) – 3 nos. 1. Heat 30ml (1.5 cups) of water and add mutton pieces. Then add turmeric powder. Boil well until mutton pieces are done. 2. Strain the mutton and keep it aside. Heat oil in a pan. Add cardamom (elakka), cloves (crambu), cinnamon (pattai), aniseed (sombu) and chopped onions. 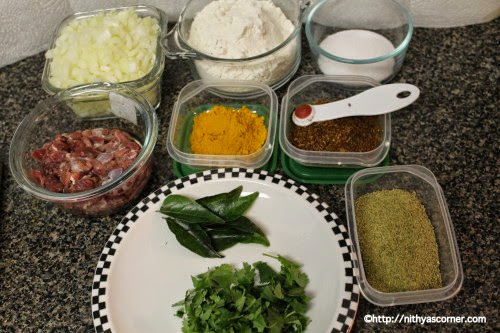 Once onions turn transparent, add coriander leaves, curry leaves and green chillies. 3. 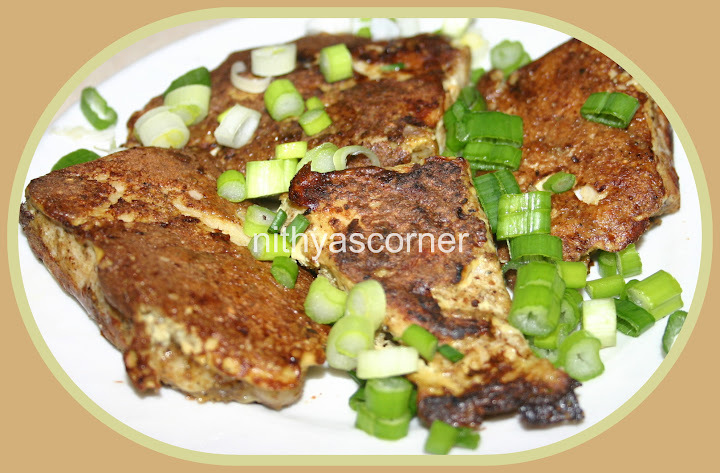 Fry well and then add boiled mutton pieces and salt. Stir well and keep it aside. In a mixing bowl, add all purpose flour/maida and salt. Combine well. 4. Add little warm water. Knead well and make a fine dough (just like how you make for rotis and poori). 5. Now take a small portion of the dough (a medium sized lemon) and make it into a ball by rolling between your palms. Using the roller, roll the ball into four to six-inch rounds. When you roll the ball one by one into a round, keep the rest of the dough covered or else it will dry out. 6. Grease the Somas achu (see in the picture below) with oil. 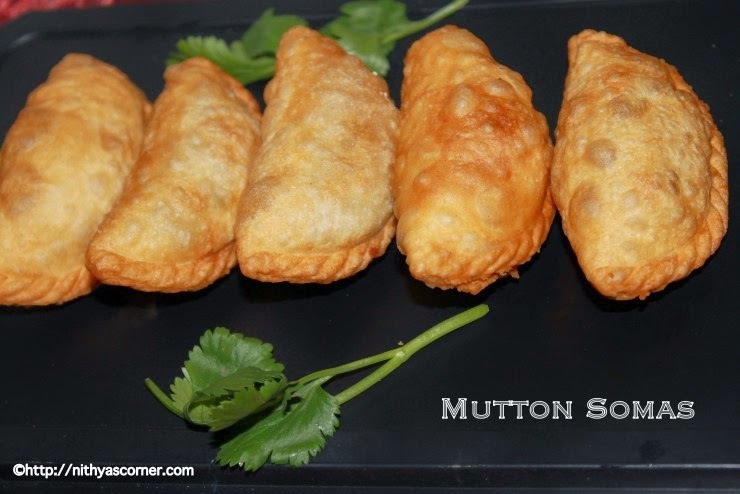 Place the rolled round dough on the Somas achu and stuff it with a teaspoon of mutton mixture. 7. Close the Somas Achu and remove the dough that comes outside the achu. When you open the achu, you can see the well shaped somas. 8. Do the same for the other balls. Keep the shaped somas in a plate. Heat oil in a frying pan. When oil is hot, drop the Somas one by one in hot oil. Once the Somas turn golden brown, remove it from the oil and drain it in tissue paper to remove excess oil. Serve. You can eat it as such or with tomato ketchup. You should eat Somas when it is hot. Over the time, it will start becoming rubbery. 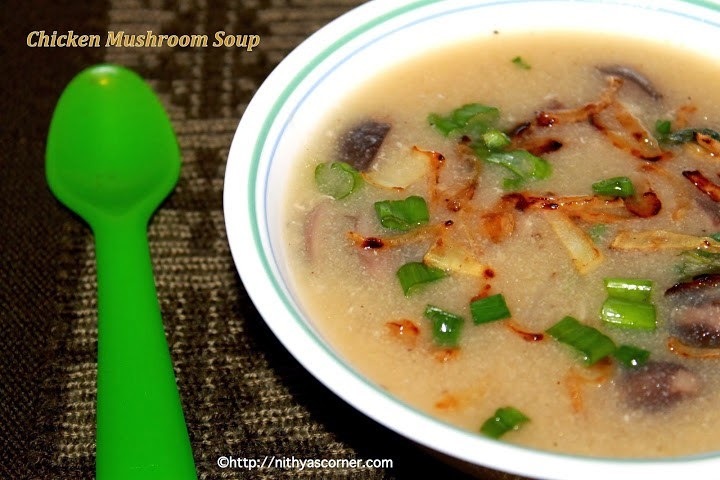 This entry was posted in APPETIZERS | STARTERS | SNACKS on November 20, 2014 by vikashbhardwaz.